Mary Jemison was born on the ship that brought her Irish parents, brothers and sisters to America in 1743. 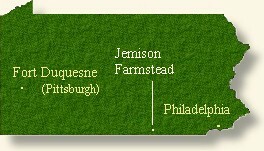 A few years later her family moved from Philadelphia to a homestead on the Pennsylvania frontier. The family toiled on the edge of civilization transforming the wilderness to cultivated soil. Each new day brought with it the fear of attack by wild beast or hostile Indian. These fears became reality on the morning of a spring day in 1758. The British colonies were engulfed in a war against the French. The Iroquois Confederacy (consisting of the Cayuga, Oneida, Seneca, Mohawk, Onondaga, and Tuscorora Indians) allied with the French against the British. On that spring morning in 1758 a small raiding party made up of French and Indians swooped down on the frontier settlement capturing a number of British colonialists including Mary and most of her family (two of her brothers escaped.) At age thirteen, Mary's life changed forever. From that day until her death 78 years later she never left the Indian culture. 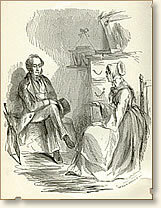 Mary's story of her capture and life among the Seneca was first published in 1824. "The party that took us consisted of six Indians and four Frenchmen, who immediately commenced plundering, as I just observed, and took what they considered most valuable; consisting principally of bread, meal, and meat. Having taken as much provision as they could carry, they set out with their prisoners in great haste, for fear of detection, and soon entered the woods. On our march that day, an Indian went behind us with a whip, with which he frequently lashed the children, to make them keep up. In this manner we traveled till dark, without a mouthful of food or a drop of water, although we had not eaten since the night before. Whenever the little children cried for water, the Indians would make them drink urine, or go thirsty. At night they encamped in the woods, without fire and without shelter, where we were watched with the greatest vigilance. Extremely fatigued, and very hungry, we were compelled to lie upon the ground, without supper or a drop of water to satisfy the cravings of our appetites. As in the daytime, so the little ones were made to drink urine in the night, if they cried for water. Fatigue alone brought us a little sleep for the refreshment of our weary limbs; and at the dawn of day we were again started on our march, in the same order that we had proceeded the day before. About sunrise we were halted, and the Indians gave us a full breakfast of provision that they had brought from my father's house. Each of us, being very hungry, partook of this bounty of the Indians, except father, who was so much overcome with his situation, so much exhausted by anxiety and grief, that silent despair seemed fastened upon his countenance, and he could not be prevailed upon to refresh his sinking nature by the use of a morsel of food. Our repast being finished, we again resumed our march; and before noon passed a small fort, that I heard my father say was called Fort Canagojigge. That was the only time that I heard him speak from the time we were taken till we were finally separated the following night. Toward evening, we arrived at the border of a dark and dismal swamp, which was covered with small hemlocks or some other evergreen, and various kinds of bushes, into which we were conducted; and having gone a short distance, we stopped to encamp for the night. Here we had some bread and meat for supper; but the dreariness of our situation, together with the uncertainty under which we all labored, as to our future destiny, almost deprived us of the sense of hunger, and destroyed our relish for food. 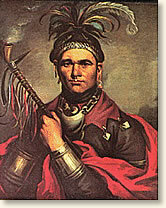 The Indian led us some distance into the bushes or woods, and there lay down with us to spend the night. The recollection of parting with my tender mother kept me awake, while the tears constantly flowed from my eyes. A number of times in the night, the little boy begged of me earnestly to run away with him, and get clear of the Indians; but remembering the advice I had so lately received, and knowing the dangers to which we should be exposed, in traveling without a path and without a guide, through a wilderness unknown to us, I told him that I would not go, and persuaded him to lie still till morning. After a hard day's march we encamped in a thicket, where the Indians made a shelter of boughs, and then built a good fire to warm and dry our benumbed limbs and clothing; for it had rained some through the day. Here we were again fed as before. When the Indians had finished their supper, they took from their baggage a number of scalps, and went about preparing them for the market, or to keep without spoiling, by straining them over small hoops which they prepared for that purpose, and then drying and scraping them by the fire. Having put the scalps, yet wet and bloody, upon the hoops, and stretched them to their full extent, they held them to the fire till they were partly dried, and then, with their knives, commenced scraping off the flesh; and in that way they continued to work, alternately drying and scraping them, till they were dry and clean. That being done, they combed the hair in the neatest manner, and then painted it and the edges of the scalps, yet on the hoops, red. Those scalps I knew at the time must have been taken from our family, by the color of the hair. My mother's hair was red; and I could easily distinguish my father's and the children's from each other. That sight was most appalling; yet I was obliged to endure it without complaining. In the course of the night, they made me to understand that they should not have killed the family, if the whites had not pursued them." References: Seaver, James E., Life of Mary Jemison (1824, reprinted 1856). "Captured by Indians, 1758 ," EyeWitness to History, www.eyewitnesstohistory.com (1999). Mary spent five more days in the wilderness before arriving at the French fort. Shortly after, two Seneca sisters took her down the Ohio River and adopted her as one of their own. Mary spent the rest of her life with the Seneca, marrying twice and bearing a number of children. She moved to the Genesee River area of New York where she remained.